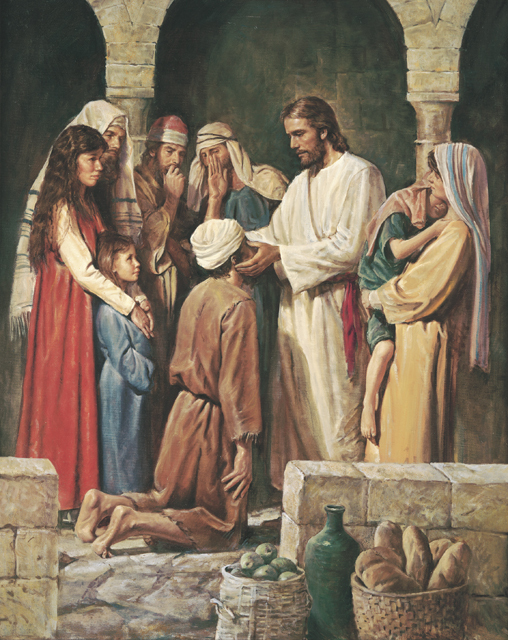 What You'll Need: scriptures, two identical small toys, gift wrap, a brown paper bag, GAK 213: Christ Healing a Blind Man OR GAB 42: Christ Healing the Sick at Bethesda, printed sign language sheet or coloring page, coloring tools, ingredients to make simple snack. You can also choose to download the pdf of LESSON 11 for easy printing. If you download, please leave a comment here on what you like about this lesson. Note: GAK vs GAB pictures explained here. Scripture: 1 Samuel 16:7 - Look not on his countenance, or on the height of his stature...for the Lord seeth not as man seeth; for man looketh on the outward appearance, but the Lord looketh on the heart. Attention Activity: Before FHE buy two identical, small toys (I got mine from the dollar store). Wrap one in beautiful wrapping paper and a ribbon. Wrap the second in a plain brown paper bag. Have a child open the first and then the second. Ask if the wrapping the toys came in made a difference on what was inside. Last week we talked about the gift that Heavenly Father has given to each of us when he sent us to earth to get our physical bodies. Heavenly Father is the father of our spirit. He sent us to earth , not just to get physical bodies, but also to live and grow and learn. When God sends us to earth our spirits are perfect. We are like him. But sometimes the bodies were are born into don't work the same way as others do. Our bodies are not perfect. Some people can't hear. They talk with their hands in a language called sign language. Some people cannot see. They may use a seeing eye dog or a special cane to find their way around without being able to see. Some people cannot walk and they use walking braces or a wheel chair to help them get around. Some bodies have more serious problems like not being able to walk or talk and sometimes their hands and arms are crumpled into different shapes than ours. Sometimes someone can look like their body is fine, but they may have a hard time making friends, or learn things very differently than others do. But even though others may be different than us, we can still be their friend. I still believe in having fun. My mind goes racing everywhere. And meeting other girls and boys. Jesus loved everyone no matter how different they seemed. During his life he met many people that others would not be friends with. He healed people with disabilities, but more importantly he loved them, no matter what. No matter what makes our bodies different, our Spirits are the most important part of who we are. The Proclamation on the Family tells us that our spirits existed before we were born and they will exist long after we die. Our spirit and heart grow and develop when we love others, are patient and kind and when we try to become more and more like Jesus Christ. Bear your testimony about Christ like love and friendship towards people of all kinds. 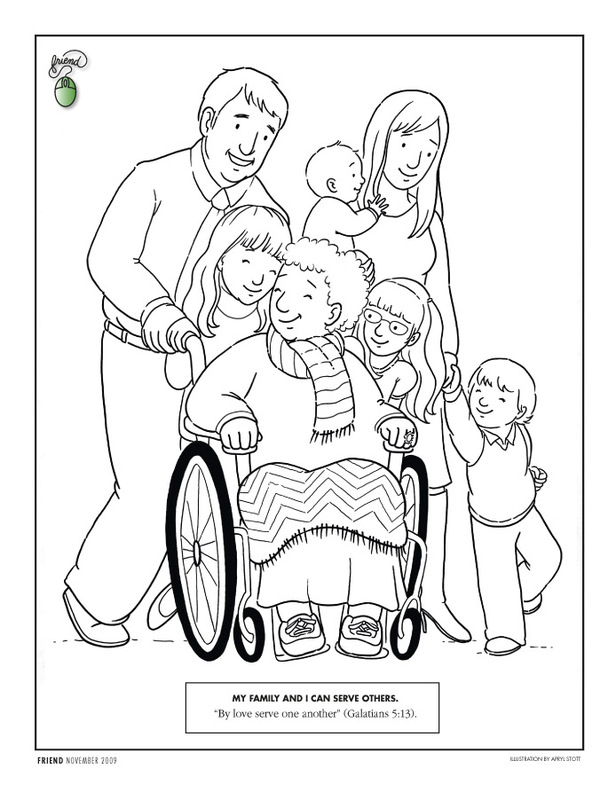 Share with your children people whom they may already know and love who have a type of disability and express your love for them. 1. 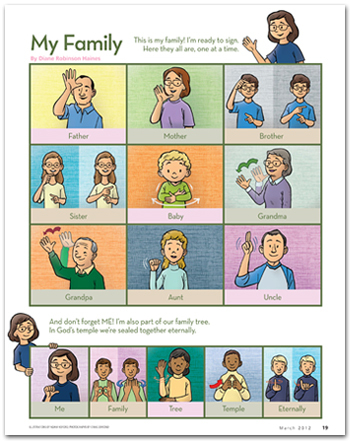 Learn some sign language as a family. CLICK HERE to print a color chart with simple sign language. 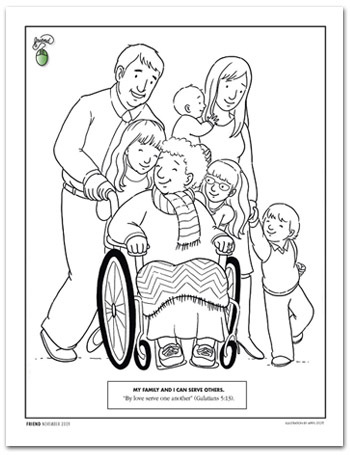 CLICK HERE to download and print coloring page. 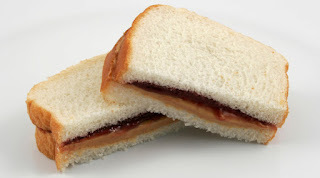 Make a treat your children are very familiar making, like a peanut butter and jelly sandwich or toast. Have the children attempt to make it with a blindfold on or using only one hand. Discuss how much more difficult it is to accomplish even simple tasks when they cannot use every part of their body. Thank you! I have a young child with special needs, we struggle with telling our older children about his dissabilities. Thank you for such a wonderful lesson! This is a great lesson. We had a deaf women in our Ward and I have worked with deaf children. Thank you for this great blog! I just found it and am so excited! This is Perfect for our family also. I have a daughter who is deaf. Thanks for all of your lessons!! Thank you i have only been to the church for 4 yrs now i think and i have never done this by my self and i am a mom of two one is 20 and on her own now and no longer in the church and one is 5 and its been hard for me with being to only one in my family in the church there is no dad for my kids as well and i have been falling away from the church and i can see that so i ask someone for help on this and she sent me here so i am looking forward to coming here every week thank you for your kindness. I love the idea of packaging the same gift in very different ways. Our son has Down Syndrome and I can not think of a more perfect way to explain how Barrett is different yet the same as our other children. 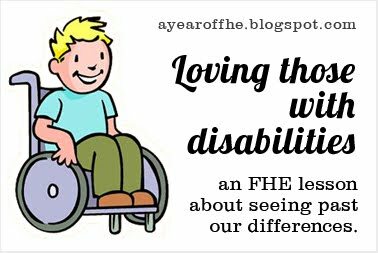 This is my first time to your site and I will excitedly be back again in the next few days to start preparing for our next FHE. This site is a beautiful testimony of your love for our Heavenly Father . Thank you so very much. I love this lesson! At school my kids see others with disabilities all the time, I hope this lesson helps them understand and want to be kind to them. I love this. It is so important for us not to fear those that are different from us. It is so important to learn this at an early age. I especially like "making toast blindfolded."